Why you need to build habit? The purpose of building a habit is to make yourself one percent better each day. Improving by one percent is not noticeable but over a period of time. You will produce an astounding result. If you improve one percent better each day, at the end of one year. You will become thirty-seven percent better. Habit matters because over a period of time your habit decides how successful and unsuccessful you become. But the dark side of habit is that it does not show result until you crossed a certain threshold. Once you plant a seed of good habit and works until habit sprout. Then, amazing thing start happening in your life. How you build belief unconsciously? Your actions are driven by your belief; however, you are not born with any belief. All beliefs you have learned so far is taught you through religious and society. If you found any negative belief does not add value in your life. You can replace with positive one. Do you think about how you build your belief? Whatever the person you are right now is the outcome of your belief. As belief drive actions and add vote to your identity. Example: If you visit to the gym each day. Even if it is raining outside. Then, you strengthen your belief. As you have evidence that you are committed to fitness. Habits are actions that influence your personality. As you repeat these actions more and more often. You are adding more evidence to your belief and strength your identity. Each time you perform an action you add a vote in your belief. No belief can build in a single instant but repeated action cast more votes and strengthen your belief. New identity requires a new belief. If you wish to become a writer, start practicing writing every day. Each day you perform a writing activity you add a vote in your new identity. Then, over a period of time, your tiny actions piled up and build a new identity. Once you define the type of person you want to become. You can start taking tiny action to reinforce your beliefs. The Science of habit sprouting. Building habit requires four areas to take care of clue, craving, response, and reward. The clue is the first stage of habit sprouting that triggers your brain. Our conscious mind continuously analyzing the external environment to find clue. As clue indicate to reward that naturally lead to craving. Craving is the second’s state of habit that motivates us to follow a path, once we get clue. Third stage is response. In this stage, we actually perform a behavior. But if a particular behavior requires more mental and physical energy. Then you will not able to perform any behavior. The last state of building a habit is reward. Reward is the end point of every habit. Your reward of any habit, decide whether are going to perform the same action tomorrow or not. Each time you see a specific clue, you will perform a certain behavior to get reward. We follow the path of habit to satisfy ou rdesire for pleasure. As you go through in life. Your sensory nervous system continuously analyzing clue to satisfy your desire. A feeling of pleasure or disappointment is a part of a feedback system, which tells your brain which behavior is worth remembering. The best approach to start a new habit. Do you think why we fail to build a new habit. We always told yourself that I will do more work or from tomorrow I will start exercising. But we are unable to perform these activities. why? It is not about the motivation you lack. It is because you are unclear about your actions. Once you define where and what time, you are going to perform an activity. Then, you will more likely to perform activity. The benefit of Implementation intention technique is that you determine your certain behavior with respect to time and place. Then, you are more likely to say nothing that put you off from your track. The best approach to frame implementation intention sentence. I will [behavior] at [time] in [place]. I will meditate at 7 am in my room. I will walk at 8 am in the garden. Habit staking technique is used to build a new habit. But it is bit different from implementation technique. This technique is use to tie old behavior with new one. Framing of sentence in habit stacking technique. After workout I will go and take shower. You can also use habit stacking technique to add a new habit in your routiene. Wake up > turn off alarm > make my bed. Wake up > Turn of alarm > drink a glass of water > make my bed. You are more likely to perform an action that clue is obvious in your environment. The environment makes it easy for you, to not to perform a certain action, as there is no clue for them. Likewise, you are more likely to perform an action that clue is obvious to you. Example: If you want to drink more water, fill up few water bottles and place them in each corner of the room. Your habit is largely depended upon the room you are in and clues that are in front of you. Your environment is an invisible hand that help you to perform certain actions more often. The truth is the actions you performed each day is not performed by your choice but by most obvious options. However, you can train your mind to link particular habit with a particular context. Because for someone couch may be the place to watch television and eat ice-cream. But for others, it might be a place to read books. Your behavior in the environment is determined by the relationship with object. One time investment in building habit. Once you made a habit of doing a certain activity on a certain time. And discipline yourself to follow a schedule. Then, following the schedule will become your habit and encoded in your brain. Once you formed a habit you will more likely to perform a certain action when the clue appears. But, the twist is, if you did not use your habit for a while, your habit is still encoded in your brain. And it is impossible to remove the behavior. Role of culture in developing habit. You adapt habit from your culture, the way your colleague deal with a customer, the way your partner handle argument, and if your partner has the habit to check door prior to sleep then surely you will also adopt this habit. Now if you want to build habit but unable to sustain it. Find a culture and join them where your desire habit is performed by other people. Finding and fixing flaws in your habit. Habit is used to solve a problem and reduce the burden from your conscious mind. The main purpose of habit is to reduce the stress level and to make task automated. But if your current habit is unable your reduce stress level. You can alter with new one. For some people cigarette is used to reduce stress level while others prefer to walk. Once you tie up your problem with a solution. You will always come back to your same solution to get relief from pain. It depends upon your wiring. What you predict when you saw a clue. Your prediction will define your feelings and which lead to craving. The same clue can spark good habit as well as bad. It all depends on what your prediction is. Through prediction, you can make hard habit even more attractive by remembering pay off in the future. All you need a slight shift in mindset. Habit becomes attractive when you associate it with a positive experience. Likewise, it becomes unattractive when you associate with a negative experience. If you want to avoid bad habit, make it unattractive. Motion or Action, in which area you are putting your energy. Habit is used to automate the behavior. Each time you repeat your behavior, the more efficient you become in performing the behavior. We decide the goal to make a plan and then figure out habits that require to accomplish the goal. But, most of the time, we get trapped in making a perfect plan. We start spending a huge chunk of time to figuring out perfect plans that produce desired result. We stuck in what author called ‘motion and taking action’. Action is a behavior that produces desire result while motion is a process of accumulating data, making plans, and figuring out a strategy to produce desired outcome. These are all the good thing but did not produce desired result. Example: If I make a plan to read ten books and then compose a list of books I am going to read in the next two months. But in the end, it will never produce desired outcome. If I sit down and start reading a book. That’s called action and will surely produce desired outcome. Fuel is required to run the engine. Likewise, energy requires to do various activities of a day. Energy is precious and our brain tries to conserve it in every possible way. Here the law of effort come into play. It says when we need to choose between two option, we always prefer one that requires the least amount of energy. The more energy required to perform a certain task less chance you are going to perform it. Example: If you make a goal of doing fifty pushups, then there is less chance to perform the activity. As it requires a huge form of energy. But doing one pushup a day requires a less amount of energy. And more chances of pursuing an activity. That why we prefer watching YouTube videos, checking emails, and using Facebook. We are more like to perform these activities as these activities require a little amount of effort and can be performed with almost no effort. Optimization of your environment is a good approach to reduce friction. Making clue obvious so that you can perform your activity with least resistance. Conflict arises when we try to build a habit in high friction environment. We try to read ten pages a day when our smartphone is placed nearby us, however, we can reduce friction and utilize our time and energy more effectively. The central idea is to create an environment where the persisting habit is easy for you. Tie your habit with reward. You are more likely to repeat a behavior that makes you feel good. Feeling of pleasure, even minor once tell our brain ‘Hi this feel good’ try one more times. Feelings of pleasure force our brain to remember this behavior, however, if your behavior is not satisfying you will not perform the behavior in future. The best approach to sustain a good habit that pays you off, in the long run, is to add a bit of pleasure. While building a good habit, you need reasons to sustain on any good habit. Early on, building a good habit is all about sacrifices. At difficult times, reasons help you to stay on track. This is why the instant reward is essential as they keep you excited while delayed reward accumulated in background. We tend to remember more if the reward is satisfying. That’s why the ending of any good behavior must be satisfying. The best approach to reinforce good behavior is to add an immediate reward, once the habit is performed. Habit tracker is used to measure the progress of any habit. It helps you to determine how far you have reached. Progress is the most effective form of motivation. Each day when you see your progress in visual form. You will become motivate and do more hard work. But, visual measurement comes in many forms like moving marbles from one container to another or making a cross in calendar nearby the date. This activity provides clear evidence of progress. And on the other side, this visual measurement reinforces your behavior and a little bit of immediate pleasure. In bad days, habit tracker becomes the most powerful motivating tool. Days when you do not like to work, and may feel like to stop making progress. But Visual proof of your habit motivates you to be on track and remind you how far you have reached. Perfection is not possible. There will be days when you are not able to perform any behavior. But never miss twice, if you miss one day, it happened. Do not miss two days in a row. Because missing two days in a row will also create another habit. Each day performs an activity, even if you like it or not. Each time you perform a behavior you add a vote in the person you want to become. Exercise: Going to the gym, even if you do not want to work out. Add a vote in the person you want to become. Signing habit contract with accountability partner. Habit contract is a written agreement used for creating a habit. In this contract, write down your habit and schedule at what time you are going to perform your habit. As well as the consequence, if you miss the habit even for one day. In end, you need to sign with your accountability partner. The consequence of missing the habit must be scary. It should be something that does not make you feel good. Like paying $100 to your partner or wearing Alabama in your office. Once you aware yourself of the consequence of leaving habit even for one day. You will less likely to procrastinate. Making continuous growth as well as the motivation level. You need to do tasks that can be coordinated with your current ability and skills. Because if the task is too difficult you will lose motivation and if it is too easy, you will become tedious. When you do activities according to your current abilities and skills. You will stop procrastinating, distraction fades away, and you will able to give your full attention on the task at hand. 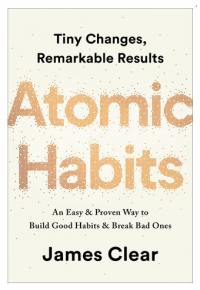 Above article is the extract version of the book “Atomic Habits” written by James Clear.